The UK's energy minister is expected to make calls for a staggering four million solar panels to be installed on government land and buildings. Greg Barker is expected to make the announcement in the new year: The plans would see solar panels covering land the size of 3,400 football pitches built on government property including prisons and schools. However the plans are understood to be more of a 'personal ambition' of Mr Barker's, rather than an official Government target. He hopes by 2020 to have 22 gigawatts of solar power installed. According to the Solar Trade Association this would be divided into thirds with household roofs equating for a third, large buildings another third and the final third made up of solar farms. In a speech earlier this month, the energy minister said: "We need to make the Government itself a leader in solar deployment. 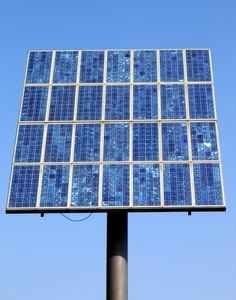 "Government public buildings should be at the forefront of the move to renewable energy. So next year you can expect to hear more from me on my ambitious plans to ensure the government estate plays its part in the decentralized energy revolution. "The government is sitting on huge potential; we need to do much more." Estimates from the Solar Trade Association suggest for one gigawatt of solar energy, four million panels would be required. Put into perspective using its land use estimates, this would equate to 3,4000 football pitches. Solar farms are not without their controversy however, and have been criticised for potentially ruining agricultural land, something the STA has argued strongly against. Leonie Greene of the Solar Trade Association said: "Solar farms have an important role to play delivering green power at low-cost. Done well solar farms can also actively help boost British biodiversity by providing wildlife sanctuaries. "Only five per cent of the land a solar farm is on is taken up with fixings, so 95% of the land remains available to other uses. The solar industry is moving to make sure much of that land is used to help our threatened flora and fauna."